This entry was posted on Friday, May 23rd, 2008 at 1:14 pm	and is filed under nds, software. You can follow any responses to this entry through the RSS 2.0 feed. Both comments and pings are currently closed. i have done all the tings in the manual but i get midi? not sure if i understand your problem there – all control data is sent/received as midi. the device doesn’t do any actual audio mixing, that’s the job of the DAW (e.g. reaper). send me an email, i’ll see if i can sort you out. Just downloaded this and successfully used it with reaper. i am trying now to use it with another daw known as sonar (7 to be exact). 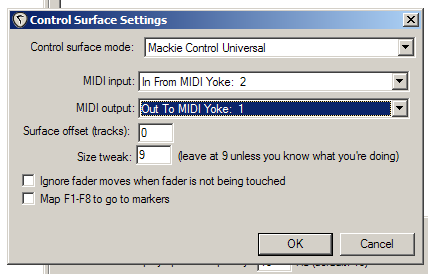 unfortunately, sonar doesn’t have a mackie controller universal surface. it does have a “generic surface” which i think is responding to the controller. would it be possible to give me a list of the midi channels dsmcu uses? p.s. : I don’t know if it is your website or something, but I cannot capitalize my letters. stuff like exclamation points and parenthesis work. re: i’ll email you a partial controller list. if anyone else needs this, comment here and i’ll post it to you. the “cakewalk generic surface” has a “learn” function which determines where a signal is being sent from, and from that point, I can assign a function to be controlled by that midi signal. there are only two problems, the first of which being that sonar won’t let me choose a “no midi input” for its midi tracks (which is no fault of your own, obviously) and recording midi might be problematic when moving the sliders requires sending midi data over a channel that might be in use. a way to remedy this might be to use a given note on a given channel for each slider and use the note velocity to control volume. in the future, you might consider adding the ability to control which channel/note a slider is broadcasting over, though I could probably go down the banks (my songs don’t involve many midi channels right now) and have some of the higher channels control the lower channels’ volumes. The second problem is that i have no idea how to send out the vu data to my ds so i can use your nice bar graphs with sonar. sonar probably has some method of sending that data out, and it’s only a matter of time until I discover it. other than that, everything works great! thanks for the great homebrew! p.p.s: It appears that my letters are being capitalized, but they don’t appear capitalized in the textbox for comment submission below. Bug? Just a quick query… do you know if its possible to get dsmcu working on a pc running ableton live? i’ve got dswifimidi working fine, midi yoke installed and i’ve even got dsmcu working with reaper. it definitely works, at least as a midi controller (there are youtube videos of people using it with ableton, hunt around). i think you need to do a heap of midi assigns though. possibly check out how people get the bcf2000 hardware controller working with ableton live, it’s probably a very similar setup. Just wondering if there’s any news on an update? no news yet – i did some work on it a week ago or so but just so damn busy at the moment. the project is definitely not dead, though. Im using it with ableton live on a mac and everything is running smooth. This app makes me want to learn programming. I could do with some more buttons and faders tho, a new page with lots of buttons or some way of switching between different setts of midi outs. What do you plan on doing next with it? Together with Colors, this is the best application for the DS ! I am trying to use your app on a Nintendo ds Lite with Reaper. Now, I had DSMCU working just once, using Mackie Control Universal as you suggest. Then, I tried to change the control surface to Behringer BFC2000 (since I have one): now, it does not connect anymore to the network (not even if I select again the Mackie Control Universal). The app keeps showing “MIDI ?” and the led on the Nintendo blinks slowly (no network connection). I started testing and after fiew days when i ran dsmcu “midi?” apears for 5 minutes. It means ds wont connect. I started checking every possible properitys. All was ok. HMMM. Router? Mariocart over WFC works fine. When i change channel from 6 to 8 on router’s wifi settings all comes back. App runs great. Connection works. I’ve got plans to use dsmcu on my live PAs. We’ll see. So check everything including router. Probably too big traffic on wifi freq. TXH for app and waiting for news and updates.